At EXW, we are constantly looking for tools that will help worship leaders and worshipers grow in their personal worship experiences and in their corporate worship settings. Over the past five to ten years we have seen an explosion of creativity in the church. The use of creative video, high energy music, drama, visuals such as lights and stage design, scripture readings, dance and more are the best I have seen in the church. It has been exciting to see how God is using churches around the world to draw people into worship through the creative arts. As a Worship Pastor, I am constantly looking for new ways to communicate Biblical truths in our worship services. I seek out creative ways to draw people to Christ and help those who know Him to be encouraged to better live for Him. I am also looking for ways to help our body find materials that will help them in their personal walks with Christ as true worshipers of the Father. I would like to share with you one of our findings that we feel will stir your heart in your personal devotion times as well as encourage your body in your corporate settings. The Clay Doesn't Question by Connie Hallam is filled with Biblical truths expressed through well written poetry and creative writings that will inspire you to know the heart of Christ better and encourage you to love Him more and serve Him better. As I began to read, I found myself reminded of many Biblical truths that I have not thought of in a long while. I was moved spiritually, emotionally and intellectually as I went from writing to writing. I must confess that I am not one who sits around and reads poetry all day. In fact, I haven't read a poem in years. I found it difficult to put this down. As I continued to read, I began to imagine these writings used in our corporate worship services. I could see them as sermon intros, lead-ins to songs, stand alone pieces for special occasions. My mind began to race with the many uses for this collection. As much as I enjoyed it personally, my church could benefit as well of these truths expressed so creatively. 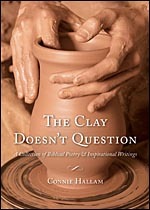 If you would like to discover The Clay Doesn't Question, please click on the link below. You will find it a treasure that will enrich your life and the life of your church.